Abandoned and disease ridden, Rushpa had no where to turn. The last four years were heated with continuous shivers for Rushpa Sardar, a wife and mother of seven. She had been suffering from the body aches and chills associated with fevers. 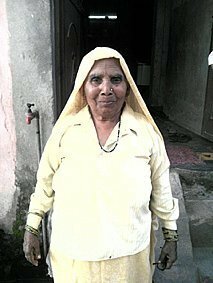 She was taken to many reputable hospitals, tried local homeopathies, and even dared to consult help from witch doctors. Regardless of how many medicines she took and remedies Rushpa tried she could not get rid of her constant fever. There was no cure. “I was helpless,” Rushpa said. However, her helplessness melted into hopelessness when her husband could no longer endure her boiling illness and left her for another woman. Although there was not much to live for anymore, Rushpa looked forward to visits from her children and grandchildren. One day, her grandson, Abhi Ayyar, decided to pop in for a visit. He told her he was now a Christian and a TTI church planter committed to sharing the Gospel of Jesus. Rushpa’s dark world turned into a place of light…She was excited to share it with everyone she knew. She tried so many solutions, so Rushpa figured what was one more? She would not be surprised if another god failed her, but she was willing to listen to her grandson and give Jesus a chance. After praying, the pastor told Rushpa to go home and check her fever for the next week and then come back the following Sunday. When Rushpa realized she was cured, she decided to follow Jesus and accept him as her personal Lord and Savior. Rushpa’s dark world turned into a place of light. All the hope she had lost was restored, and with it was an abundance of peace and joy. She was excited to share it with everyone she knew. Rushpa and Abhi started a fellowship in her home, where 30-40 people gather together every Friday for fellowship and prayer. Receive encouraging stories from the field when you subscribe to our monthly newsletter. Want to hear more about how God is moving across the nations? Check out these incredible stories of life change!